Having completed that brief introductory course, I moved with the rest of my troop of 66 recruits to the Commando Training Centre at Lympstone. There we began the longest basic military training in the world, designed to prepare us for life as a Royal Marines Commando. Despite the intensity, the objective was not mindless obedience, but to follow (and question) orders while encouraging initiative and dependability. 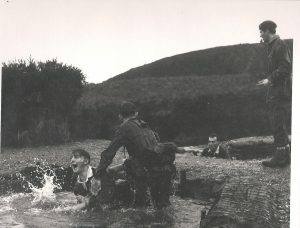 There were a lot of physical challenges – assault courses, speed marches and battle swimming tests. These were interspersed with training in weapon handling, fieldcraft, navigation, corps history, tactics and even legal issues. The (self) selection and de-selection continued and six months later just 14 out of that original 66 passed out for duty. This sounds attritional and, while our troop lost more than most a 50% drop out rate was average in those days. However, what is not obvious from the numbers is that the culture within the troop was as supportive as it was demanding. Although each individual was tested in the classroom, the gymnasium, on the moors and the parade ground, there was a strong ethic that if one failed, we all failed. This was literally true of the regular speed marches (running as a squad carrying battle order, weighing in at 30 lbs and a 9 lb rifle) – if anyone did not finish in time, the whole troop ran again the next day. We started very much as individuals competing to better each other, but soon became a team who worked together to collectively overcome the challenges of the programme. This is how we nurture and develop the unique ethos that helps the Royal Marines excel as an organisation. Incidentally, Royal Marine officers train at the same centre and have a higher standard to achieve in all of the Commando tests. The theme of this article is leadership and this is fostered in every recruit from the start. They are all expected to show personal leadership through self-discipline and are also required to take turns at leading sections during training exercises. Those who show particular potential will be earmarked for fast track promotion on joining their operational units. The four elements of the Commando Spirit, Courage, Determination, Unselfishness and Cheerfulness are what turn individuals into commandos. What shapes how they work as a team, giving the Royal Marines its special identity are the Commando values and the wider set of group values. 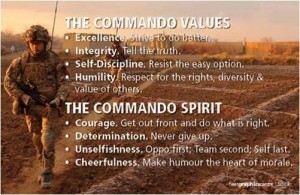 The seeds of these values are sown during training and further developed when joining a commando unit. Joel Kurtzman in his book of the name, describes “Common Purpose” as a new concept. I would accept that the label and understanding is relatively new, but it has been part of what makes commandos into leaders for a long time. While not having the luxury of a long training period, few organisations have an induction process that shares the values, purpose and culture that they are looking to promote.